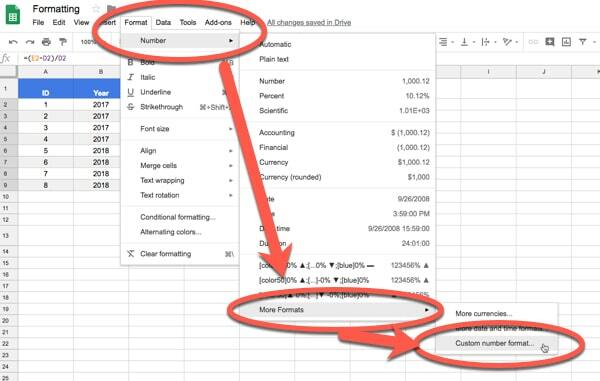 A collection of formatting tips for how to make a table in Google Sheets. Go for bold, center-aligned and wrap the text, so it all shows. Let’s align those columns, they’re messy! Center column headings, ID numbers, or other standardized entries. Right align numbers (which they are by default). Really the only exception to this rule is for numbers that are not really numbers, i.e. they’re not being compared against each other or being used in any sort of calculations. For example, the ID numbers above can be center aligned. Right align dates (which they are by default). However, if you’re working with just a year, as in the example above, you can get away with center aligning, just be consistent. Choose appropriate formatting options for the data in your tables. Add thousand separators to big numbers above a thousand. Add currency signs to financial numbers to add context. I could stop the article here, as the table is now sufficiently formatted to maximize legibility. However, for tables that are part of dashboard reports or are being presented to clients, you can add colors to match your branding, or bring additional context to your numbers. Sure you can do this manually, but it’s way easier and quicker to do with the Alternating Colors tool under the formatting menu. Checkboxes (☑️) are now available in Google Sheets! Here’s three ways you can use them. Hidden in the Custom Number Format menu is a conditional formatting option for setting different formats for numbers greater than 0, equal to 0 or less than zero. 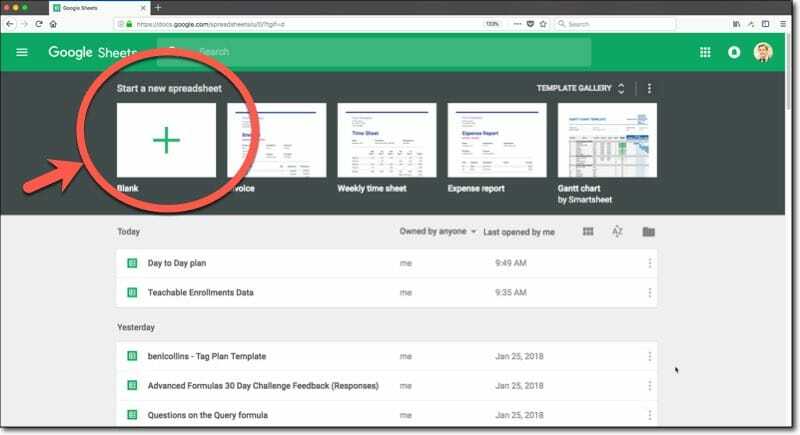 It’s a great tool to apply to tables in your Google Sheets dashboards for example, where the data is changing. By changing the color of a table cell’s text as the data changes, you can bring it to the attention of your user. It’s significantly easier/quicker to read and absorb that information. Now, copy and paste them as values in your Sheet so they look like column C and are not formulas any longer. You’ll need to copy these to your clipboard so you can paste them into the custom number format tool. What you’re doing is specifying a number format for positive numbers first, then negative numbers and then zero values, each separated by a semi-colon. Copy in the symbols from step 1 (you’ll have to do this separately for each one). Use the square brackets to specify the color you want e.g. [color50] for green. Sep 18 announcement: Whew! This was a big task, but today I’m proud to announce that my video training courses are bang up-to-date! I sent out emails to students earlier today, announcing updates to 40 videos in my Google Sheets training courses. 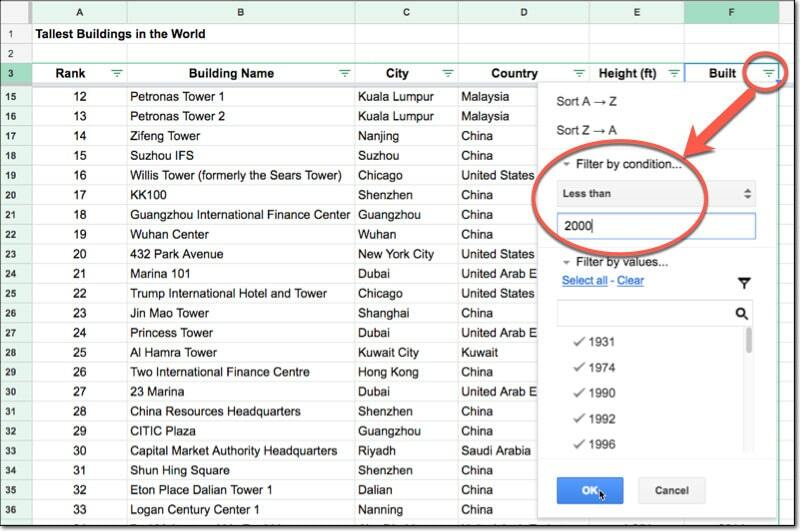 The Google Sheets Filter function is a powerful function we can use to filter our data. 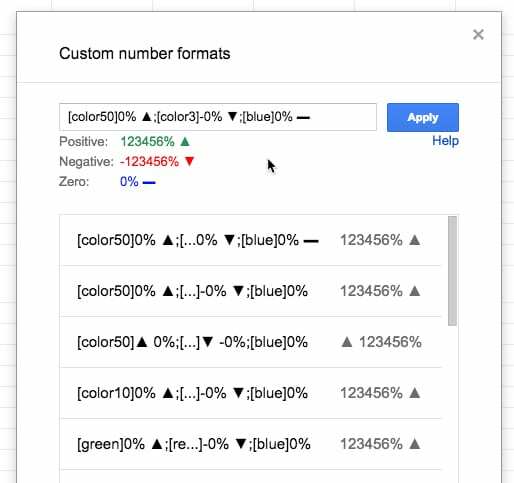 The Google Sheets Filter function will take your dataset and return (i.e. show you) only the rows of data that meet the criteria you specify (e.g. just rows corresponding to Customer A). Suppose we want to retrieve all values above a certain threshold? Or values that were greater than average? Or all even, or odd, values? 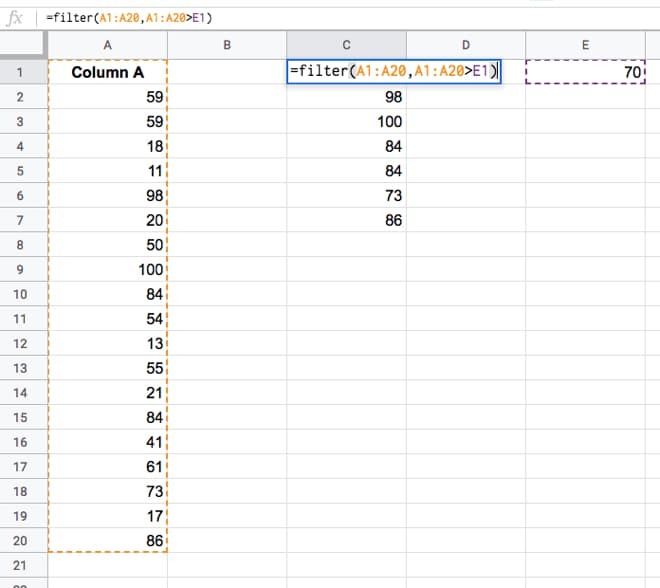 The Google Sheets Filter function can easily do all of these, and more, with a single formula. This video is lesson 13 of 30 from my free Google Sheets course: Advanced Formulas 30 Day Challenge. What is the Google Sheets Filter function? In this example, we have a range of values in column A and we want to extract specific values from that range, for example the numbers that are greater than average, or only the even numbers. where Condition 2 onwards are all optional i.e. the Filter function only requires 1 condition to test but can accept more. How do I use the Filter function in Google Sheets? Can I test multiple conditions inside a Google Sheets FILTER function? Can I test multiple columns in a Google Sheets Filter function? Note, using the Filter function with multiple columns like this demonstrates how to use AND logic with the Filter function. Show me all the data where criteria 1 AND criteria 2 (AND criteria 3...) are true. Can I reference a criteria cell with the Filter function in Google Sheets? Instead of hard-coding a value in the criteria, you can simply reference another cell which contains the test criteria. That way you can easily change the test criteria or use other parts of your spreadsheet analysis to drive the Filter function. For example, in this image the Filter function looks to cell E1 for the test criteria, in this case 70, and returns all the values that exceed that score, i.e. everything over 70. Can I do a filter of a filter? Google documentation for the FILTER function. 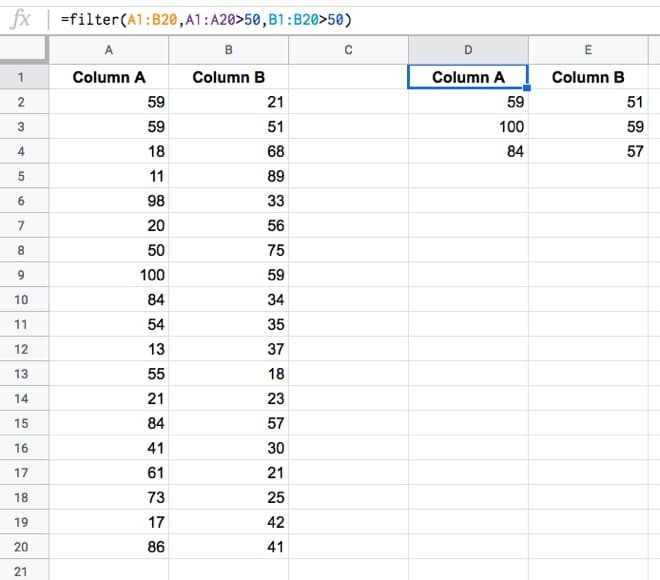 How to use an advanced filter with an OR condition in Google Sheets. Knowing the trick will save you hours, so you can filter multiple conditions easily. 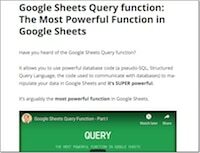 Learn how to use the super-powerful Google Sheets Query function to bring the power of SQL to your data, with this comprehensive tutorial and available template. 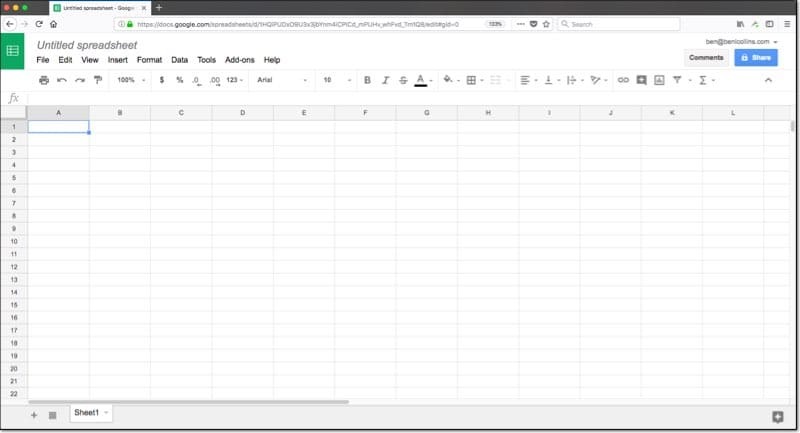 This tutorial will help take you from an absolute beginner, or basic user, of Google Sheets through to a confident, competent, intermediate-level user. 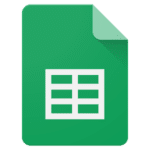 Google Sheets is a hugely powerful tool, for everything from digital marketing to finance modeling, from project management to statistical analysis, in fact, just about any activity involving the recording and analysis of data. And if you’re (relatively) new, it really pays dividends to learn how to use Google Sheets correctly. This tutorial will help you transition from newbie to ninja in short order! If you’re new to Google Sheets, then I recommend you start from the beginning of this article. However, if you’ve used Sheets before, feel free to skip sections 1 and 2, and begin with the Data and basic formulas section. Want a copy of the template from this tutorial? How is it different to Excel? Google Sheets is a free, cloud-based spreadsheet application. That means you open it in your browser window like a regular webpage, but you have all the functionality of a full spreadsheet application for doing powerful data analysis. It really is the best of both worlds. No doubt you’ve heard of Microsoft Excel, the long established heavyweight of the spreadsheet world. It’s an incredibly powerful, versatile piece of software, used by approximately 750 million – 1 billion people worldwide. So yeah, a tough act to follow. 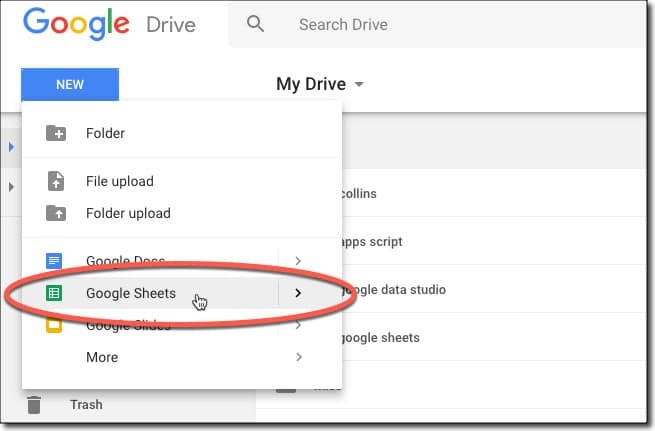 Google Sheets is similar in many ways, but also distinctly different in other areas. It has (mostly) the same set of functions and tools for working with data. 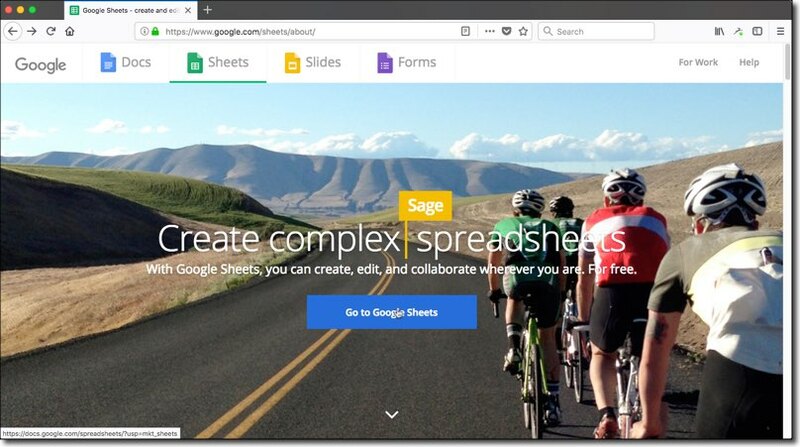 Google Sheets is cloud-based whereas Excel is a desktop program. With Sheets, you’ll no longer have versions of your work floating around. Everyone always sees the same, most up-to-date version of Sheets, showing the same spreadsheet data. Collaboration is baked into Sheets, so it works extremely well. Excel is still trying to play catch up here. Both have charting tools and Pivot Table tools for data analysis, although Excel’s are more powerful in both cases. Excel can handle much bigger datasets than Sheets, which has a limit of 2 million cells. 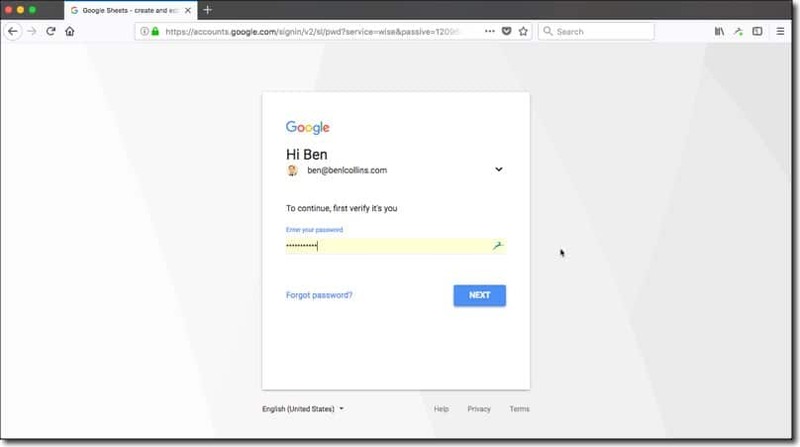 Being a cloud-based program, Google Sheets integrates really well with other online Google services and third-party sites. For the material we’ll cover in this article, there’s very little difference between the programs however. 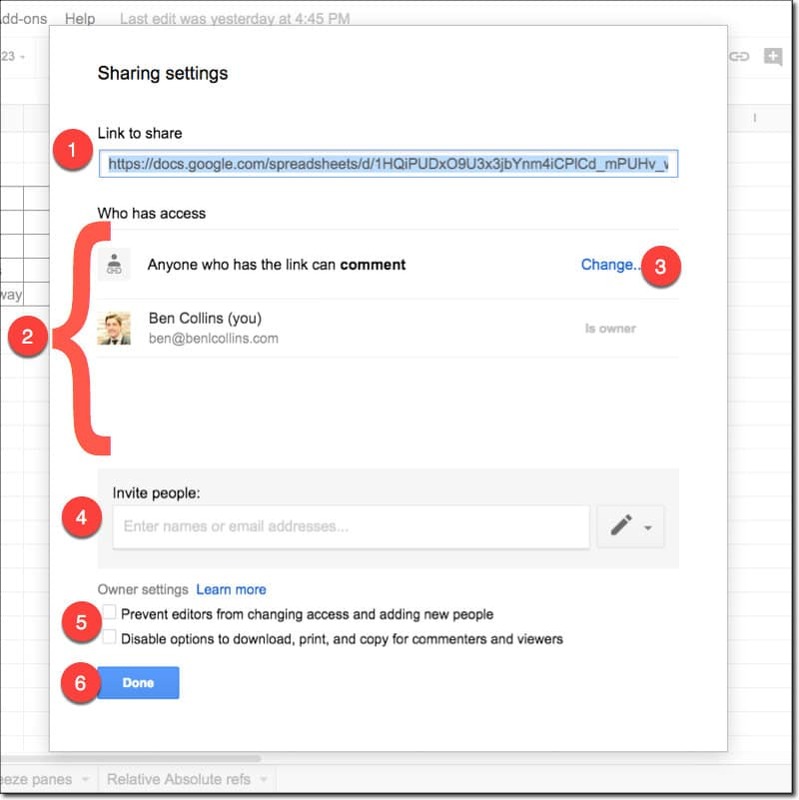 It’s collaborative, so teams can all see and work with the same spreadsheet in real-time. …it’s also really easy to use. Need more convincing? Here’s 5 more reasons from Google themselves. Can it still do advanced stuff? Absolutely! You can build dashboards, write formulas that make your head spin and even build applications to automate your job. The sky’s the limit! You’ll find lots of resources on this site for intermediate/advanced level users, as well as comprehensive online training courses. And then you arrive at the Google Sheets home screen, which will show any previous spreadsheets you’ve created. You can rename your Sheet in the top left corner. Click on where it says Untitled spreadsheet and type in whatever name you want to give your Sheet, in this example “New Sheet”. There are two menu rows above your Sheet, of which we’ll see more further on in this tutorial. The main window consists of a grid of cells. An individual cell is a single rectangle, at the intersection of one column and one row, and it’ll hold a single piece of data. The columns are vertical ranges of cells, labeled by letters running across the top of the Sheet. 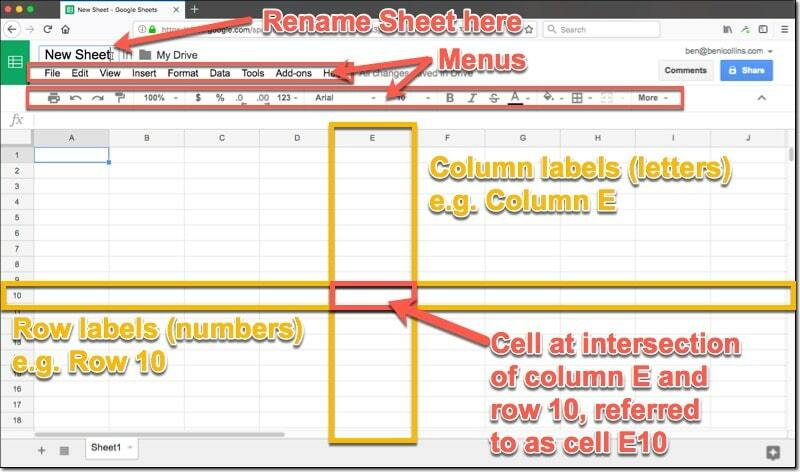 Rows are horizontal ranges of cells, labeled by numbers running down the left side of your Sheet. In the example above, I highlighted column E and row 10. Column E and row 10 intersect at one cell, and one cell only. Thus we can combine the column letter and row number to create a unique reference to this cell, E10. Now when we want to refer to this cell, for example to access data in this cell, we use the address E10 to do that. Understand this and you understand spreadsheets. The rest is just details! Now the fun really starts! Let’s start using this new blank sheet we’ve created. Hit enter when you’ve finished entering data and you’ll move down to the next cell, having completed your data entry. If you hit the Tab key instead, you’ll move across one cell to the right! Clicking ONCE on the cell highlights the whole cell. Clicking TWICE enters into the cell, so you can select or work with the data only. If you find yourself stuck inside a cell, you can press the ESCAPE key to deselect the contents and go up a level, to just having the cell selected. Try it for yourself and see how the cursor shows up inside the cell when you double-click, allowing you to edit the data. To delete the data we just entered, either click the cell once and hit the delete key, or, click the cell twice and then press the delete key until all your data is cleared out. First of all, don’t panic! Google Sheets saves every step of your work so you can always go back a step (or two) if needed. Right, with all that in mind, it’s time for a quick exercise. Feel free to use your own data if you wish. Also note that the dates entered above are in US format, with the Month first, so don’t worry if your table has the Day first. To select a row or column, click on the number (rows) or letter (columns) of the row or column you want to select. This will highlight the whole row or column blue, to indicate you have it selected. Then click and drag the cursor left or right to change the width of this column. It’s the same process to change the height of rows. Pro-tip: To quickly change the column width to fit your cell contents, double-click when you’re hovered over the grey line. If you reach the outer edges of a Google Sheet, you’ll notice the rows and/or columns stop. But don’t worry, you can add more. If you’ve scrolled all the way to the bottom of your Sheet (or added that much data), you’ll notice that you’re given 1,000 rows by default. There’s a button to add more rows if you need, either 1,000 as shown, or any number you wish (up to a limit, more on that below). If you reach the right edge of the Sheet, i.e. the last column, then you add more columns in the standard way. Right-click a cell in the last column to bring up the menu and then choose to add a column to the right. Pro-tip: If you want to add more than one column, there’s a trick to do it in one go. As an example, say you wanted to add three new columns to the right side of your Sheet, begin by highlighting the last three columns that are there already, then right clicking and choosing to inser new columns. It’ll then insert three new columns for you! Data Limit: Finally, keep in mind that each Google Sheet is limited to 2 million cells, which sounds like a lot but is 50,000 rows by 40 columns (a totally reasonable sized transaction database for an ecommerce store for example). Anyway, you’ll find Sheets slows down considerably before reaching that limit. Most people report a slight slow down with tens of thousands of rows of data and complex formulas and models. 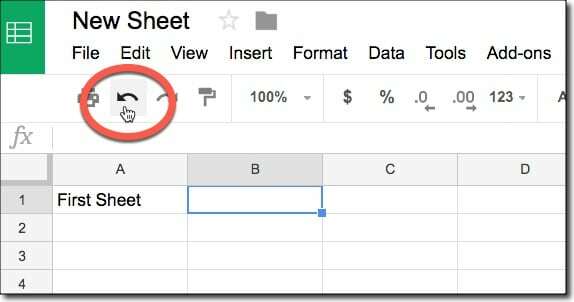 Click the big plus button in the bottom left of your Google Sheet to add a new Sheet (also called a Tab). Why use multiple tabs within your Google Sheet? Well, like a book with chapters on different topics, it can help separate different data and keep your Sheet organized. For example, you might have a Sheet solely to record your global settings (any variables like name, email, tax rate, headcount…) and another for transactional data, and yet another for the analysis and charts. The button with the three bars, next to the plus, is your index button, listing all of the tabs in your Google Sheet. This is super useful when you start having a lot of different tabs to manage. 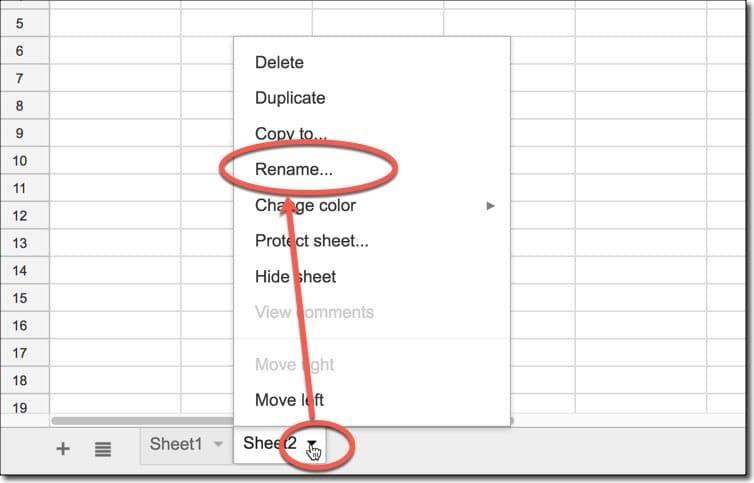 To rename a sheet, or delete a sheet, click the small arrow next to the name (e.g. Sheet1) to bring up the menu. Here you’ll see the option to rename, to delete, or even hide (and unhide) Sheets. For naming, I try to indicate what’s in that tab, so use names like: Settings, Dashboard, Charts, Raw Data. They’re similar to a word processor and pretty self-explanatory. You can always hit undo if you make a mistake (Cmd + Z on Mac, or Ctrl + Z on PC). > Add a border around the whole table. Let me show you the option to add alternating row colors (banding) to your tables. Remember, a little bit of formatting goes a long way. If you Sheet is more readable and tidy, people will be more likely to understand it and absorb the information. This is my number 1 productivity tip in Google Sheets. To remove all formatting from a cell (or range of cells), hit Cmd + \ on a Mac or Ctrl + \ on a PC. This will save you so much time when you’re wanting to remove formatting that isn’t yours or that you no longer want or need. 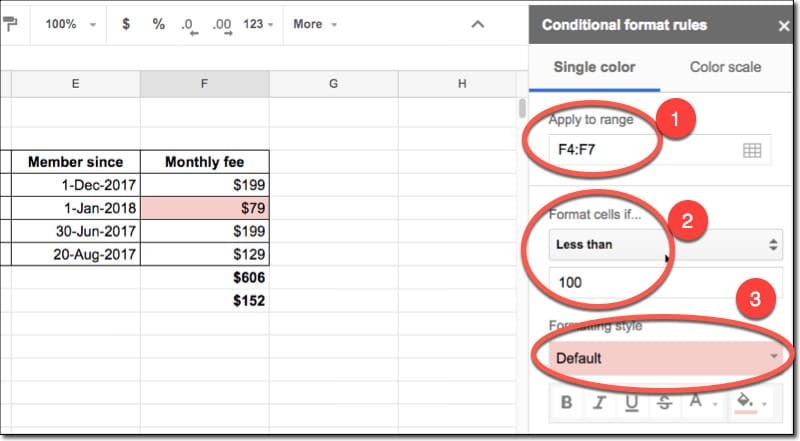 You’ve already seen different data types in Google Sheets in our basic table. The key point to understand with spreadsheet data is that each cell contains the data itself, and a format applied to that data. In each case the underlying data is the number 2, but with a different format applied each time. If we add 2 to each of these cells we get back the number 4 in every case (with formatting applied). You’ll notice that currency data, percentage data and even dates are actually just numbers under the hood (dates? Really? Yes, they are, but that’s a discussion for another day). They’re all right-aligned, hanging out on the right edge of their cell. Text is left-aligned by default. If you want to force something to be stored as text, you can prepend a single quote, ' before the cell contents. So typing in '0123 will show as 0123 in your cell and be left-aligned. If you omit the single quote mark, then it’ll be stored as a number and show up as 123 without the 0. Easy-peasy, just like you do on a calculator. You click the cell you want to do your calculation in, type an equals sign (=) to indicate you’re performing a calculation and then type in your formula, e.g. Notice how calculation will show in the formula bar (1) as well as in the cell (2). You’ll notice that you get a preview of the answer (in this case, 25) above the formula. Technically you’ve already written your first formula in the section above on math calculations, but really, your formula career begins when you start using the built-in functions (of which there are hundreds!). Returning to our basic table, let’s count how many members we have, what the total monthly fees are and what the average monthly fees are. You can either keep typing COUNT in full, or find it and select in from the list (hover over it and click on it OR hit enter OR hit tab). In this case, the COUNT function is expecting a list of numeric values. Note: COUNT is used to count numbers. If you want to count text (for example the names) then COUNT won’t work (it’ll give you a 0). Instead use COUNTA (with an A at the end), otherwise the method is the same. Your turn! Try creating a total for the membership fees in cell D8. 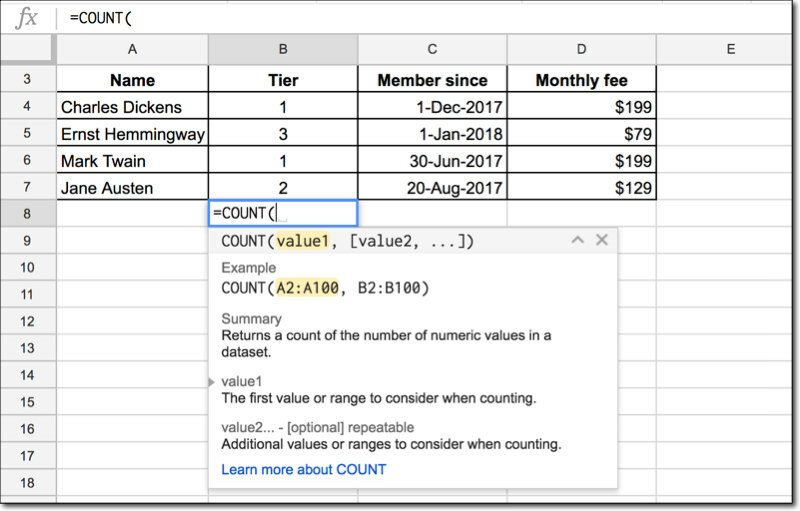 Follow the same process as the count function, except use SUM and highlight the values in column D.
You’re on a roll, so go ahead and calculate the average of the membership fees. Use the AVERAGE function in cell D9. If you make a mistake with your formula, you’ll see an errors message, probably something like #N/A, #REF!, #DIV/0 etc. You’ll need to re-enter your formula and correct it before proceeding. These error messages do give a lot of context though, so they’re worth understanding. What’s the difference between a function and a formula? Well, both are used interchangeably and rather loosely so I wouldn’t get hung up on it. For the pedantic, a function refers to the single method word (e.g. SUM) whereas a formula refers to the whole operation after the equals sign, often consisting of multiple functions. Let’s suppose you wanted First Name and Last Name, rather than just simply Name as we have in our dead famous authors membership table. How do we go about doing that? 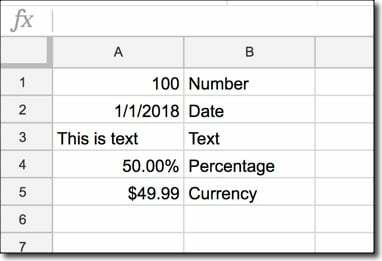 Well of course, as with everything in spreadsheets, there are lots of ways, but let me show you the easiest, using the Text to Columns feature. Back to our basic table, create a new column to the right of Name before the Tier column, i.e. create a new, blank column B. On the sub-menu that shows up choose SPACE and marvel at how Google Sheets separates the full name into a first and last name. Feel free to rename the columns First Name and Last Name too. Oh, blast I hear you say! You meant to keep hold of that full Name column as well. No problem, let’s learn how to combine text so we can rebuild it. 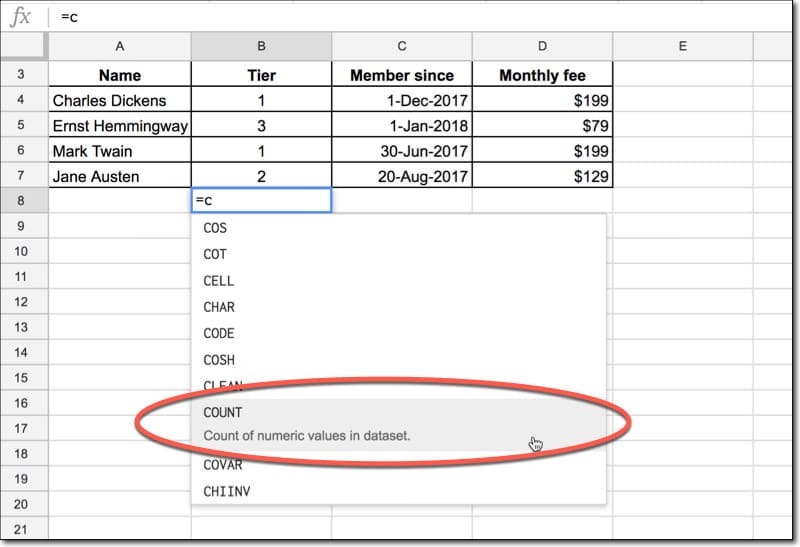 Insert a new blank column between B and C (between Last name and Tier) and call it Full Name, in cell C3. What it does is combine the data in cell A4 with the data in cell B4 and output it in cell C4. That’s obviously not good enough! We need a space between the names! Your formula is sitting pretty in cell C4, but how do you get it to work for the other rows? iii) drag the formula down by holding the little blue box at the bottom right corner of the blue highlighting around the original cell. The neat thing is that as you copy this formula down, the cell references will change from row 4 to row 5, row 5 to row 6, etc., automatically! How cool is that! 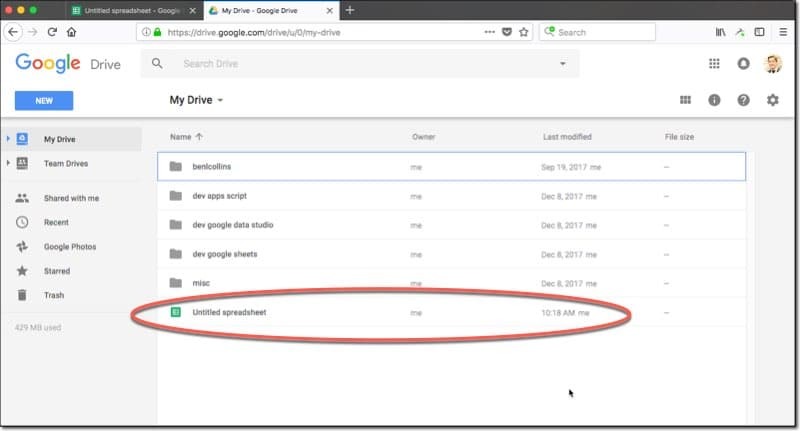 Let’s see some of the unique, powerful features that Google Sheets has, as a cloud-based piece of software. Want to add some context to numbers in the cells of your Sheets, without having to add extra columns or mess up your formatting? Add a comment to a cell! You can tag people (via their email address) who you want to see the comment too. They can reply and mark it resolved once it’s been acted upon. You can also add simple notes to cells as well if you wish. Comments and Notes can also be deleted when not required anymore. To add a comment to a cell, first select the cell, then right click to bring up the menu of options. Select “Insert comment” and then simply type in your comment. To tag somebody in your comment, type the plus sign (+) and their name or email address (you’ll see auto-complete options from your contacts, so you shouldn’t have to type in the whole email address). You’ll notice a small orange triangle in the top right corner of the cell to indicate the comment. The comment will show up when you hover over this cell. If you click on the cell, it’ll also add orange shading to the cell background. Comments can be edited, deleted, linked to, replied to and resolved (comment disappears from Sheet and is archived). You can reach and control all the Comments in your Sheet from the big Comments button in the top right of the screen, next to the blue Share button. You can also add a note to cells in the same way (look for it in the menu next to Insert Comment). It’s like a pared down version of a comment, intended for your own reference. 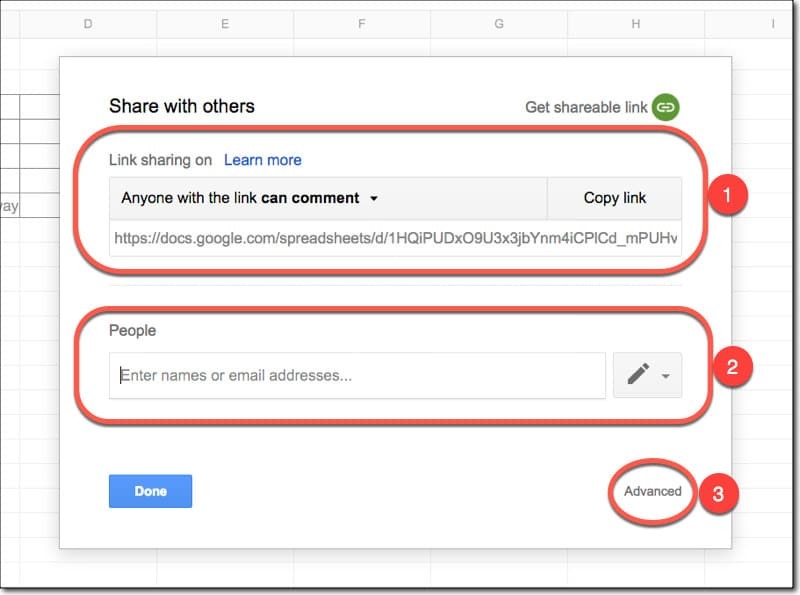 You can share your Google Sheets with other people. Since it’s on the cloud, they can access your Sheet and see the same, live Sheet that you’re in. In other words if you make changes, they will show up automatically and in near real-time for everybody viewing the Sheet. You can have multiple people viewing and working on the same Sheet. I’ve used the link from the sharing settings to share the template for this tutorial with you! Ok, so you’ve shared your Sheet with someone. If they open it whilst you’re still working in the Sheet you’ll see their cursor show up on whatever cell (or range) they’ve selected. It’ll be a different color, for example green to your blue. If they enter data or delete data you’ll see it happening in real-time! In this case my active cell is the blue-outlined cell. I see somebody else, denoted by the green-outlined cell, show up in this Sheet and enter data into a few cells before deleting it. This is one of the most useful tricks you can learn in Google Sheets, which is why I’m recommending you learn it today. Sooner or later you’ll work with a table of data that continues beyond the area you see on the screen (right now for example, I can see as far as row 26, but it depends on your screen size and other factors). When you scroll down to look at data further down in your table, you lose the column headings off the top of your screen, and therefore can’t see the context of your columns. Of course, scrolling up and down to see what the column headings are makes no sense. It’s a sure path to spreadsheet errors and insanity! What you need to do is freeze the heading rows. Now your headings will stay in place. Ah, that’s much better! You can do the same with columns, if you wished to freeze names for example, so you can scroll horizontally across lots of columns of data. This is arguably the hardest concept to grasp in this tutorial. If you understand it and can apply it, then you have a really good understanding of how spreadsheets work and you’re well on your way to being a skilled user. This formula will retrieve whatever data is in cell A1 and show it in cell B1. Now copy the formula (Cmd + C on a Mac, or Ctrl + C on a PC) and paste it (Cmd + V on a Mac, or Ctrl + V on a PC) somewhere else on your Sheet, for example cell D5. The formula is there, but it points to a different cell, not A1, so does not show the data from A1. But it still points to the cell that is ONE TO THE LEFT AND ON THE SAME ROW as the original formula. The formula copied perfectly, keeping the same structure, pointing to the cell on the left. This amazing property is called a relative reference, meaning it’s in relation to the cell where the formula is (e.g. one to the left). That’s why you can drag formulas down columns and they’ll change automatically to calculate with data from their row. Now then, if you want to fix your formula (for example so it always point to cell A1) then you’ll want to use what’s called Absolute Referencing. We lock the cell reference in the formula, so Google Sheets knows to not move the reference when the formula is moved. Now, wherever you copy this formula, the output will always point to cell A1 and return you the data from cell A1. Note, you can just lock the column or just lock the row reference, and leave the other part as a relative reference, but that is beyond the scope of this tutorial. Sticking with the topic of referencing other cells for the moment, how does one go about linking to data on a different Sheet? Note the exclamation point at the end of the reference to Sheet1, i.e. Sheet1! Now let’s do a simple sum of data on Sheet 1, but show our answer on Sheet 2. This will return the sum of the range of cells F4 to F7 in Sheet 1 and print out the answer in Sheet 2. Conditional formatting is a powerful technique to apply different formats (for example background shading) to cells based on some conditions. Let’s see an example of conditional formatting, that is, formatting based on variable conditions. For example, in a financial model, you might show positive asset growth with a green font color and a light green background, whilst negative growth might be shown with red lettering on a light red background. This gives extra context to your numbers, and pre-attentive attributes (the colors) help to convey the message more efficiently. Notice the range is shown (1), then a drop-down menu to choose a rule (2) and then the formatting option (3), which is default red in this case, although you can go completely custom if you choose. The power of conditional formatting is to highlight data dynamically. The formatting is based on a rule, so if another value should drop below the threshold ($100 in this case), it will trigger the formatting rule and be highlighted red. Sorting your data is a common request, for example to show transactions from highest revenue to lowest revenue, or customers with the greatest number to least number of purchases. Or to show suppliers in alphabetical order. You get the idea. So let’s sort the dead famous authors gym membership table, from earliest members to most recent members, i.e. we’ll sort our table based on the date column. and be sure to check the “Data has header row” option. Then you can select the column you want to sort by, and sort option from A to Z, or Z to A. The next step after sorting your data is to filter it to hide the stuff you don’t want to see. Then you can just look at the data that is relevant to the problem at hand. Taking the world’s tallest buildings data again, let’s apply a filter to only show skyscrapers built before the 2000s. You’ll notice a light green shading applied to row and column headings of your filtered table, and also a green border around your table. Most importantly though, you’ll now have little green filter buttons in each of your heading cells. To filter out all the buildings built in the year 2000 or after, click the little green triangle next to the column heading Built, to bring up the filter menu. You’ll notice you can manually select or de-select items to show. Let’s create a rule this time though. To remove the filter, click the green triangle button again (now solid green) and under the “Filter by conditions” set the rule to “None”. There’s also a native FILTER function, by which you can formulaically filter your data. As a final exercise with the tallest building data, let’s draw a chart to show the buildings built by year, so we can see the trend graphically. First, let’s sort the table by the year Built column, from oldest to newest. We can do this using the sort function that is provided in the menu when you click on the green triangle (from the filter). This creates a default chart in your window and opens the chart editing tool in a sidebar. 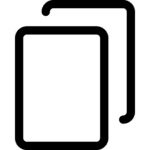 Here you can change your data range and chart type, as well as a multitude of chart custom formatting options (which are also generally accessible by clicking on the elements directly in the chart). The chart is an object in your Sheet now. Click it to select it, so it has a blue border around it. You can resize it and drag it to move it, just as you would with an image. Soon we won’t have to create complex formulas or charts ourselves. We’ll simply ask our Sheet to do it for us. Sound far fetched? Well, you can do that now! The future is here. 52 buildings in my set. The earliest tower on the list was built in 1931 (the venerable Empire State Building!) and the most recent built in 2017. The average of all the years built is 2007. Some interesting and useful data points, without having to do a lick of work! Wow! At a glance we have the min and max heights, but more impressive, we know that 80% are under 1,480ft tall. Not all of the “insights” are useful, and I don’t use this feature much myself yet, but it shows a glimpse of how we’ll all work with Sheets in the future. If you’re still not worried about AI taking over your job (whether that’s data analysis work or something else) in the next 10 to 50 years, then have a read of this article. 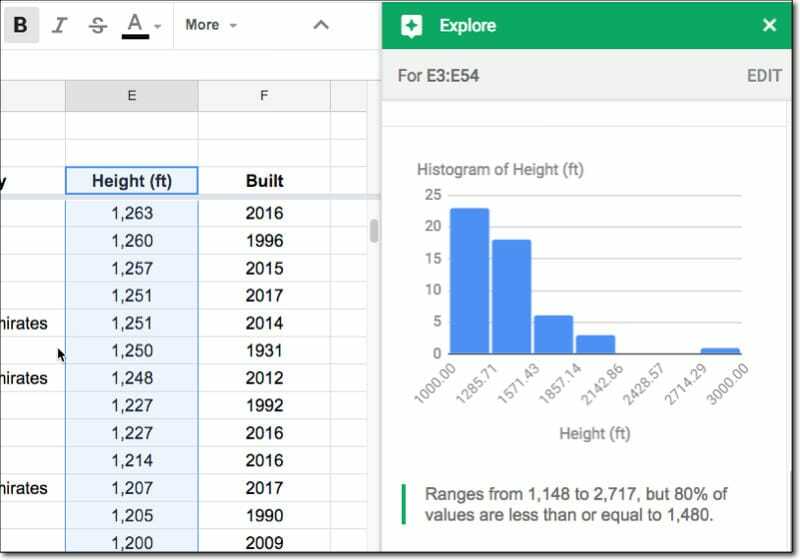 No “How to use Google Sheets” article would be complete without at least a quick look at the VLOOKUP function. It’s a good bellwether for spreadsheet competency, even though there are ultimately better ways to work with data. It’s also a relatively advanced formula compared to what we’ve seen so far, so if you can understand it, it bodes well. It’s used to search for a term and return information about that term from a different table. Generally it’s used when you have two tables that share some common attribute (e.g. a name, or ID number, or email), but otherwise store different information. Suppose you want to bring this information together though. Well you can, and you link the information via that common attribute. One table might have details an employee’s name and address, and the other table might have their name and work details like title and salary. You can use the VLOOKUP function to bring these bits of data together in a single table. In words: you select a search term which you search for in the first column of the search table. If you find it, you return a piece of information from the search table that relates to the search term (because it’s on the same row). The column number refers to which column of the search table you return the data from (1 being the column you searched in, so typically this number is 2 or greater). Let’s see an example, by adding addresses to the dead famous authors gym membership table. I’ve added a second table to Sheet 1, showing the addresses of our dead famous authors. What I’d like to do is add that data to the original gym table. I want to do it efficiently with the VLOOKUP formula, rather than adding them manually. Not only is it much, much faster with larger tables (imagine ten thousand rows of data), but it’s also less error prone. The address table is in columns I and J, with the names in column I and addresses in column J. So I’ll search for my author name in column I and return the address from column J, and print the output into whichever cell I created my formula in. I search for the name (1) in the search table (2) and return the data from column 2 of the search table (3). I don’t expect you to understand all of this immediately (and there’s a lot more to this formula than what I’ve shown here), but if you try it out and persevere, you’ll get there and realize it’s actually not too difficult. The old adage “Practice makes perfect” is as true for Google Sheets as anything else, so hop to it! Keep up-to-date with new articles, course launches and exclusive offers, by signing up for my Google Sheets newsletter, and get my free 80-page ebook on Google Sheets tips. When you’re ready, check out the intermediate and advanced Google Sheets tutorials on this site. Check out my Google Sheets Bootcamp (professional training course). Check out my free Advanced Formulas 30 Day Challenge course. If all else fails, ask for help on the Google Sheets forum. Wow, that’s it for this tutorial! Happy spreadsheeting!